A clean eating Paleo blueberry muffin bursting with fresh berry flavor and a tender vanilla scented batter. These blueberry muffins will be loved by your whole family! 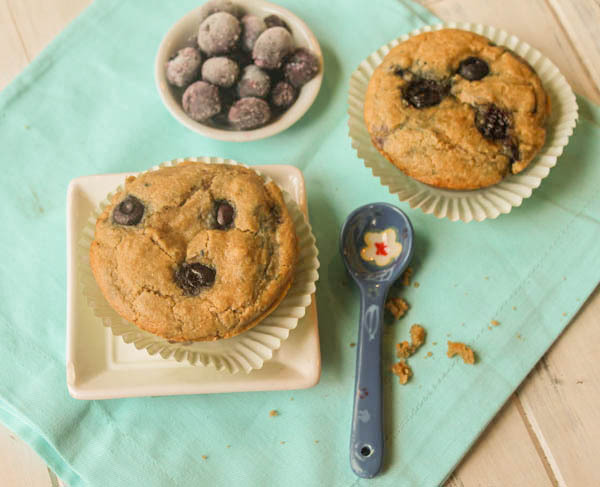 I created this simple, low sugar Paleo blueberry muffin that my kids go nuts for! It’s great to have a nutrient dense snack available for those ever hungry mouths…some days I can’t keep up! Since doing all of our healing work, nuts, eggs, and dairy have all been added back into the rotation. This makes it really easy to make a nutrient dense muffin perfect for a school send off. These are simple, moist, and easily made with any berry or add in, you get to choose your own adventure, or whatever to can find in season!! We got to use out beloved blueberry harvest from a North Idaho farm we visit every August when we are at our cabin. There is something about being able to harvest your food that is SO satisfying! And while we love them most fresh….we pick gallons to use throughout the year back home! Here in Oregon, we can find great no spray berries too!! Bring on the summer! We love the addition of the almond extract in these, but it is totally optional, you decide! If you need some different muffins, here are a couple to try!! Looking for more blueberry recipes? Preheat oven to 350 degrees and grease a 12 muffin tin. In the jar of a blender, blend all liquid ingredients until smooth. In a separate bowl, toss the blueberries with a couple of tablespoons of the flour mixture until they are evenly coated (this helps them float in the batter as opposed to sinking). Fold the liquid into the dry just until mixed. ***Take stock of the batter. With different brands of almond flour and cassava flour out there, there CAN be variability in liquids absorbed. If it seems overly thin, then add a bit of any of the above flours until a typical muffin/cake batter is achieved. Then gently fold in the blueberries. Distribute batter to muffin cups, filling 2/3 of the way. Bake for 20-25 minutes until the tops are set. ***if you are using frozen blueberries, this will effect the final cooking time, more like 25 minutes instead of 20! LOVE Paleo blueberry muffins. Yummy! Thank you for the recipe! Muffin Madness sounds like such fun! Love these Paleo Blueberry Muffins, Tessa! Thank you for sharing them with us at the Hearth and Soul Hop. Sharing. We just got some cassava flour and the flour itself tastes so sweet! It will be great to try in this recipe! I’d love to try those muffins. Blueberry is my fave! These blueberry muffins are so beautiful! I have been daydreaming about muffins like crazy ever since I got word of Shirley’s March Muffin Madness and my husband I agree that blueberry muffins are pretty much one of the BEST muffins there are! This paleo version looks perfect! So fun! I do think blueberry muffins are the best! A classic! I love muffins, this one I will try this weekend. YUMMY! These blueberry muffins look yummy! I want one right now. But I guess I have to make them first!? Can’t wait to make these muffins. I would love to win the blendtec. I want to eat these right now! These look delicious and I am in agreement that I have never used cassava flour! Hugh! I will have to look around for it. Thanks for enlightening me! I actually have everything to make these! Hallelujah! Yumm! My boys with allergies love it when i try new recipes! I keep reading about cassava flour, but have not yet given it a try. This muffins look delicious! It is awesome Melinda!! So neutral and easy to use all by itself in recipes, which is rare in the GF world!! !